The importance of making regular backups cannot be overstated. Over the years, files begin to collect on your computers: documents, pictures, videos, etc. Imagine what were to occur if your drive was to suddenly die one day? You would in effect lose all your content just like that! It is for this reason that auto backup services exist. Companies like iDrive host huge data centers stocked with powerful servers. These servers in turn back up the infrastructure for huge clouds of data that exist throughout the entire Internet. Look at it like this. Imagine having the content on your computer automatically uploaded to this cloud. Now imagine being able to log in to this cloud at anytime and retrieve any file you need. How does that sound!? iDrive has been around for a long time. It first showed up back in 1995 with the iBackup software suite for making backups on old Windows computers. It has since grown into an international powerhouse that offers online cloud storage for Windows, Macintosh, iOS and Android devices. What makes it especially alluring is that the fact that it is one of a very few storage providers that offers an entirely free service! The free service entitles you to 5GB of online space, which is not bad, especially considering that you get it for absolutely free. Furthermore, the software that comes with it works with everything. You can get a version for your desktop, a version for your Mac, a version for your phone, etc. You can share backed-up files with anybody via a simple link. This makes it much easier to share your files and media content with other people. You can access the files at anytime by just using the software or even a simple browser window. You can also use the browser to schedule backups. You can recover deleted content within a 30-day period. This is useful, because we all sometimes accidentally delete something important. It happens! Everything is secured with a 256-bit encryption key that cannot be cracked by even the top hackers in the world. This is the option we recommend. It’s extraordinarily affordable, with the cheapest plan starting at only $24.75 a year for 150GB of space. However, you can go all the way up to 2TB of space for $249.75 per year or a smidgen over $20 per month. You can install the software on multiple devices and keep all your content backed up on a single drive account. Furthermore, you can access and share it from anywhere. You get Continuous Data Protection (CDP), a feature that constantly monitors your files and makes an immediate backup the moment a change is detected. You get to take advantage of iDrive Express one time per year. The company basically sends you two 500GB drives. You fill them with content and then send them back. This is the ideal solution for most customers. What we especially appreciate is how you can backup a slew of devices. Some backup services limit you to one computer. With iDrive, the only limit is on the amount of storage space you have available. The Pro business service increases the minimum price to $49.75 per year for 100GB of space. However, you can max out at 5TB for $1499.75 per year. It’s not too different from the Personal service, except that you get access to sub-accounts. You can basically create unique accounts for all your employees. Another added benefit of the Pro Business service is that you get to take advantage of iDrive Express three times per ear. Plus, you get premier installation service The staff members at iDrive will remotely connect to your business computers and set everything up for you, if you so desire. iDrive also offers a few additional features. We mentioned iDrive Express earlier, but we want to go through them with a bit more detail here. So with this service, the company sends you temporary storage drives capable of handling 1TB of data. This is done because it’s much quicker to transfer 1GB of data directly to a physical drive than it is to transmit it to a cloud drive. Doing this can literally take forever. After you back up your content, you send the drive back to iDrive and they put it onto your cloud drive. 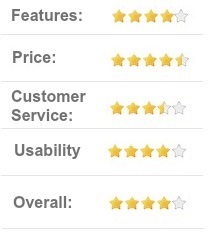 It usually costs $59.95, but it’s available as a limited free add-on service for the paid accounts. This solution is a lot like iDrive Express, except that it is designed for permanent archiving of data. It is recommended for businesses that need to regularly (perhaps once a year) permanently back up important financial files and contracts. Unfortunately, it is not available for free. If you need this service, we recommend signing up for the yearly $199.50 package. The customer service at iDrive is not bad. First, you get access to a phone support line that operates during standard business hours. Note that the company is on the West Coast, so the hours are a bit different. 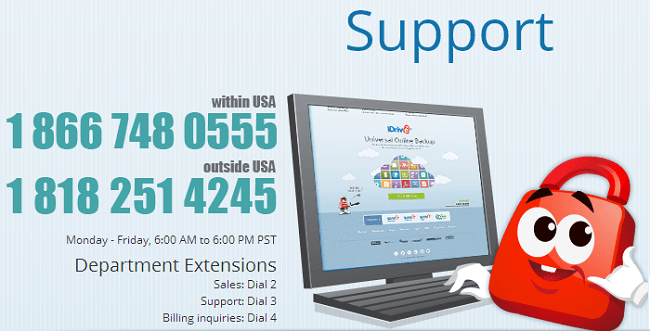 Also, you get access to 24/7 email and live chat support. There’s also a gargantuan FAQ that answers nearly any question you could possibly have. We recommend checking it out! ● Does iDrive accept refunds? iDrive accepts refunds made within 15 days or purchasing service. Any other refunds require proving why the company’s services did not adequately meet your needs. ● Does the company offer Facebook integration? Actually, yes. You can link your drive to your Facebook account. 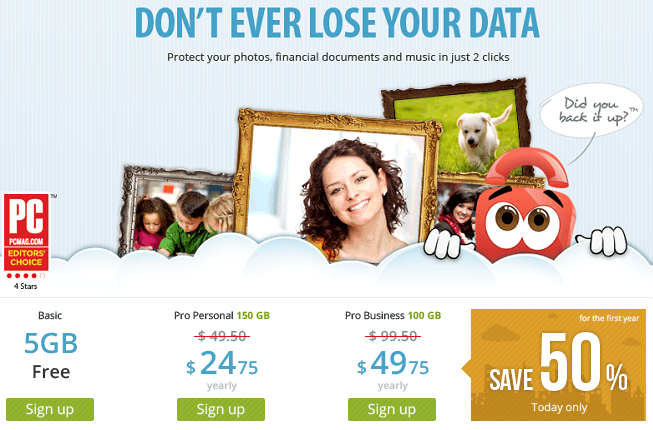 It will automatically make a backup copy of your pictures and videos. The amazing thing about it is that it also handles tagged content. Suppose a friend tags you in a video. That video would be downloaded onto your drive. 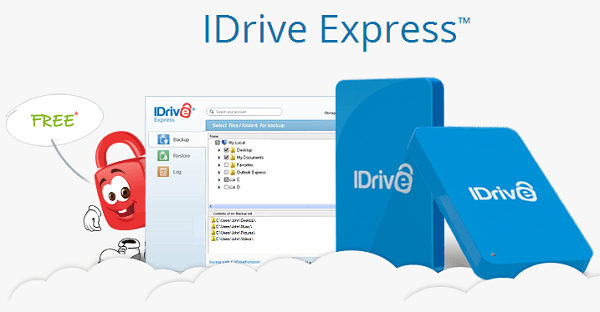 ● Does iDrive support Linux systems? Absolutely. You can access the required command lines through the company’s FAQ. ● What is the maximum data transfer size? At the moment, the most you can transfer into our out of your iDrive account is 10GB. That might seem like a small amount, but it covers nearly every file type in existence, save for some Blu-ray movies. 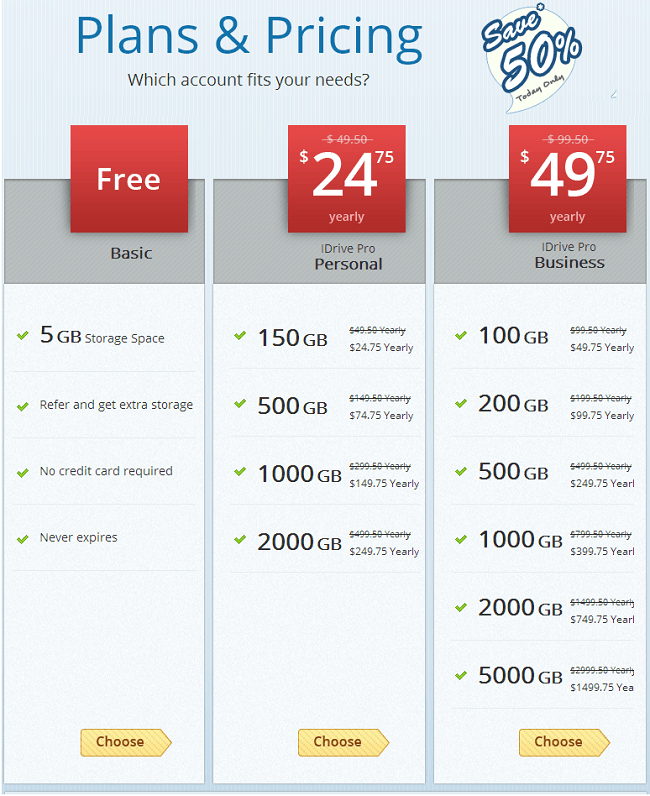 ● Can you get any additional free space for the free account? IDrive lets you earn additional space via a few different ways. You can refer up to 18 people to iDrive for a total of 18GB of added space. If you like and follow the company’s accounts on Facebook and Twitter, you can get an additional .5GB. Also, installing the company’s software suite gives you another 1GB — one for a desktop installation and one for a mobile installation. We like iDrive. We especially like the free solution. We also appreciate its flexibility. It is a rare cloud storage provider that lets you backup an unlimited number of computers and devices. This makes it extraordinarily flexible. Imagine having all of your family’s files and media automatically backed up to a cloud server that you can access from anywhere and at any time? It’s very convenient! 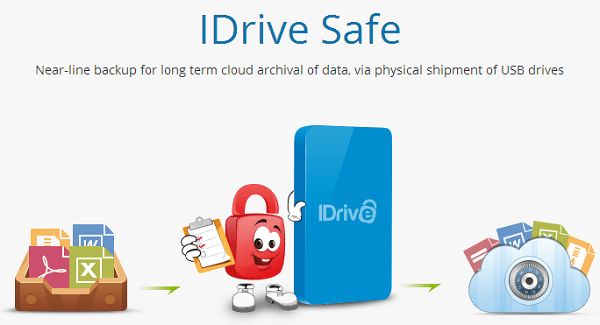 Overall, we found iDrive to be a reliable, high-quality backup company that we fully recommend for any of you seeking a good backup solution.